We're gonna keep on loving Blu this September. 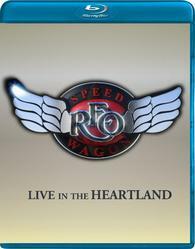 In an early announcement to retailers, Image Entertainment is prepping 'REO Speedwagon: Live in the Heartland' for a high-definition release on September 6. Captured in high-definition and mixed in 5.1 surround sound. REO Speedwagon: Live in the Heartland presents Kevin Cronin (lead vocals, guitar), Bruce Hall (bass), Neal Doughty (keyboards), Dave Amato (lead guitar) and Bryan Hitt (drums) performing a full-throttle, 16-song set that spans the band’s celebrated 35-year career – from the Number 1 charting "Keep on Loving You" and "Can't Fight This Feeling" to hits from their most recent album release "Find Your Own Way Home." The Blu-ray will feature 1080p video, a DTS-HD Master Audio 5.1 soundtrack, and supplements include a bonus interview with Kevin Cronin and Neal Doughty. You can find the latest specs for 'REO Speedwagon: Live in the Heartland' linked from our Blu-ray Release Schedule, where it's indexed under September 6.